well Stairs give access from floor to floor. The space/room housing stairs is called staircase. Stairs consists of a number of steps arranged in a single flight or more number of flights. (a) Width: 0.9 m in residential buildings and 1.5 m to 2.5 m in public buildings. (b) Number of Steps in a Flight: Maximum number of steps in a flight should be limited to 12 to 14, while minimum is 3. (c) Rise: Rise provided should be uniform. It is normally 150 mm to 175 mm in residential buildings while it is kept between 120 mm to 150 mm in public buildings. However in commercial buildings more rise is provided from the consideration of economic floor area. (d) Tread: Horizontal projection of a step in a stair case is called tread. It is also known as going. In residential buildings tread provided is 250 mm while in public buildings it is 270 mm - 300mm. where R is rise in mm and T is tread in mm. (e) Head Room: Head room available in the stair case should not be less than 2.1 m.
(f) Hand Rails: Hand rails should be provided at a convenient height of a normal person which is from 850 mm to 900 mm. because of the danger of fire. However they are used in unimportant buildings to access to small areas in the upper floors. Cast iron or steel stairs in the spiral forms were used commonly to reduce stair case area. In many residential buildings masonry stairs are also used. Reinforced concrete stairs are very commonly used in all types of buildings. If the space available for stair case is narrow and long, straight stairs may be provided. Such stairs are commonly used to give access to porch or as emergency exits to cinema halls. In this type all steps are in one direction. They may be provided in single flight or in two flights with landing between the two flights. It consists of two straight flights with 180° turn between the two. They are very commonly used to give access from floor to floor. 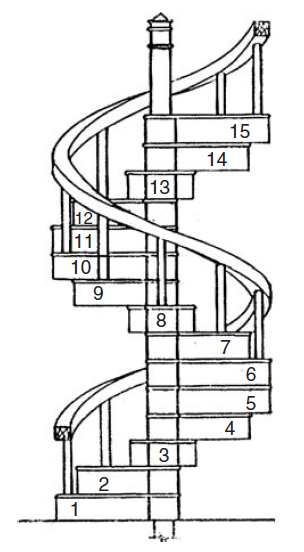 Figure 8.36 shows the arrangement of steps in such stairs. 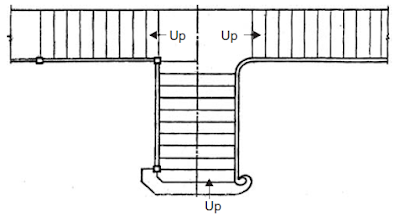 (c) Well or Open-newel Stairs: It differs from dog legged stairs such that in this case there is 0.15 m to 1.0 m gap between the two adjacent flights. 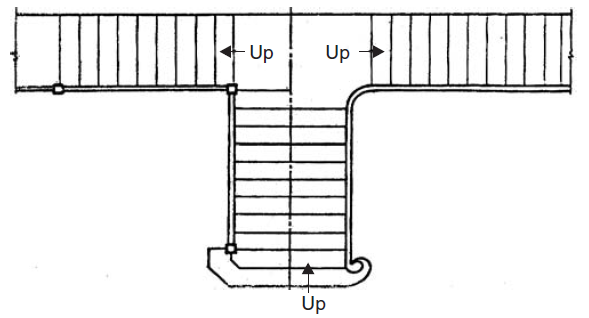 below Figure shows a typical open-newel stair. formed between the two adjacent flights is curved. The hand rail provided is continuous. (e) Spiral Stairs: These stairs are commonly used as emergency exits. It consists of a central post supporting a series of steps arranged in the form of a spiral. At the end of steps continuous hand rail is provided. 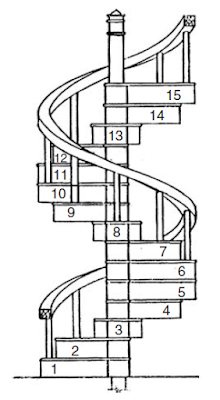 Such stairs are provided where space available for stairs is very much limited.below Figure shows a typical spiral stair. Cast iron, steel or R.C.C. is used for building these stairs. ( f ) Turning Stairs: Apart from dog legged and open newel type turns, stairs may turn in various forms. They depend upon the available space for stairs. Quarter turned, half turned with few steps in between and bifurcated stairs are some of such turned stairs.below Figure shows a bifurcated stair.